UV-B radiation inhibits the electron transport of the PSII complex by damaging the Mn cluster of water oxidation and leads to the degradation of the D1 subunit of the reaction center complex [1, 2]. In intact cells the inhibited PSII activity can be restored via de novo synthesis of the D1 subunit . The FtsH protease has been shown to play an important role in the turnover of the D1 protein when induced by visible light both in higher plants and in cyanobacteria [4, 5]. However, the role of FtsH in the damage and repair of PSII under UV-B irradiation has not been clarified. Here we studied this question by using a mutant strain of Synechocystis 6803 cyanobacterium, which lacks the slr0228 gene that encodes one of the FtsH homologues. Synechocystis sp. PCC 6803 cells were propagated in BG-11 growth medium in a rotary shaker at 30°C under a 5% CO2-enriched atmosphere. The MFtsH mutant was constructed by interrupting the slr0228 gene with a chloramphenicol resistance cassette as described in Ref. . UV-B irradiation was performed in open glass containers in which the cell suspension of 6.5 Mg Chl ml-1 formed a layer of 10 mm height. A Vilbert-Lourmat VL-215M lamp was used as UV-B light source, with maximal emission at 312 nm, in combination with an 0.1 mm cellulose acetate filter (Clarfoil, Courtaluds Chemicals, UK) in order to screen out any UV-C contribution. The UV-B intensity was 4.8 Wm-2 (≈ 13 MEm-2s-1) at the surface of the cell suspension. UV-induced changes in the transcript level of the FtsH homologue genes were detected by quantitative RT PCR. Light-saturated steady-state rate of oxygen evolution was measured using a Hansatech DW2 O2 electrode at a light intensity of 1000 MEm-2s-1 in the presence of 0.5 mM 2,5-dimethyl-p-benzoquinone as electron acceptor. The cyanobacterium Synechocystis 6803 has four homologues of the membrane bound ATP-dependent FtsH protease encoded by the slr0228, slr1390, slr1604 and sll1463 genes . We have checked the effect of UV-B irradiation on the relative transcript level of these genes by quantitative RT PCR. As shown by the data in Figure 1. all four genes were induced more than 2-fold after 90 min UV-B exposure with the most significant effect seen in the slr0228 and slr1604 transcripts. In search for the role of the FtsH protease we studied the UV-B induced damage in the oxygen evolving activity of PSII in the MFtsH mutant from which the slr0228 gene had deleted. 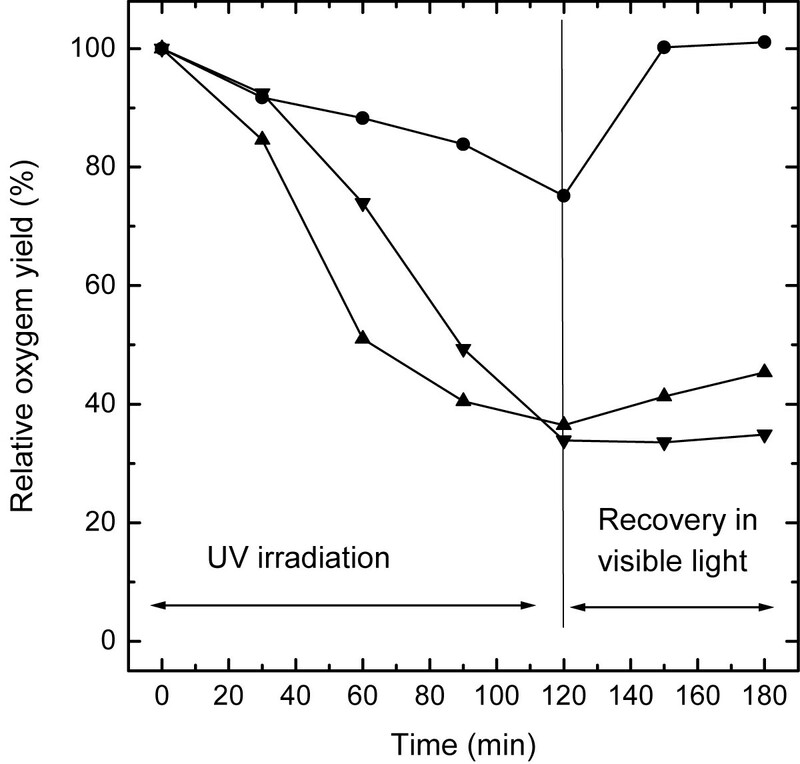 When compared to the WT, the MFtsH strain showed accelerated loss of oxygen evolution under UV-B exposure and almost complete lack of recovery under visible light (Fig. 2.). The loss of oxygen evolution in the MFtsH strain has practically the same kinetics as seen in the WT in the presence of the protein synthesis inhibitor lincomycin (Fig. 2.). Our data demonstrate that the FtsH protease is required for the efficient repair of UV-damaged PSII centers in Synechocystis 6803 cells. Considering that restoration of PSII activity requires de novo synthesis of the D1 reaction center protein , we conclude that in the MFtsH strain the degradation and synthesis of the D1 protein is blocked. This work has been supported in by a grant from the Hungarian Granting Agency OTKA (T034321).